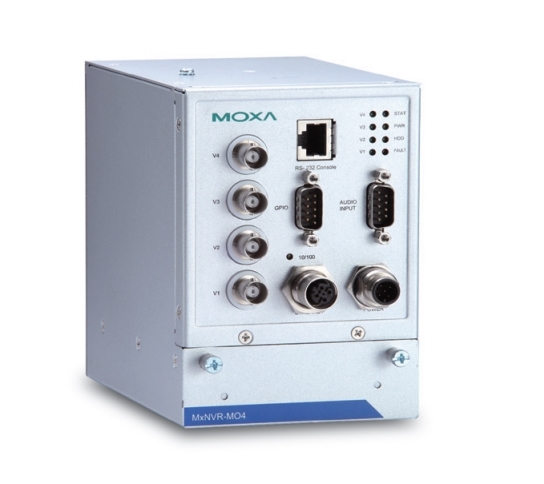 One of the distinctive features of Moxa’s industrial network video recorders is its rugged design for harsh environments. These include no heater or fan, a -40 to 75°C operating temperature, and protection against high EMI and surges. In addition, the recorders are able to save bandwidth when transmitting video streams back to the remote control centre or machine room for video recording. The network video recorder is tailor-made for field site applications and is well-designed for recording the VPort's MJPEG, MPEG4 and H.264 video streams. Industrial network video recorders for harsh environments. 4-channel H.264/MJPEG streaming video recorders for mobile surveillance.